chilled for much of the hike. 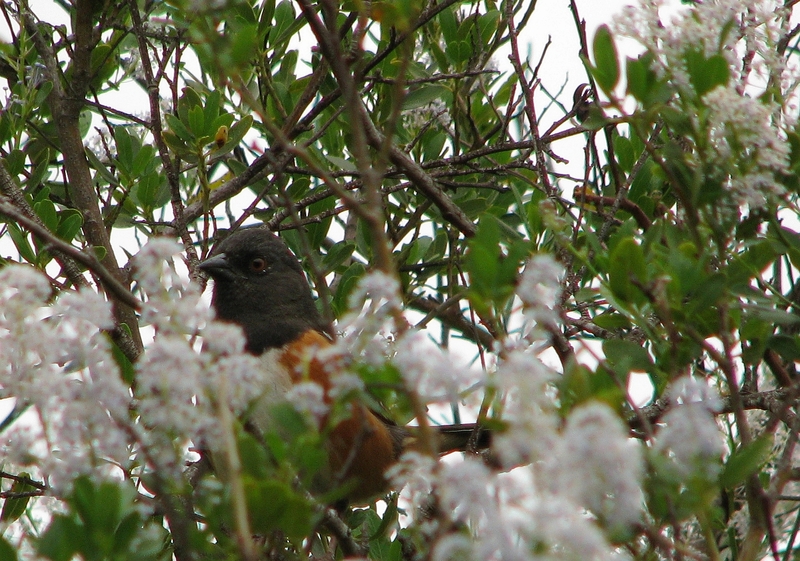 The flowers and birds, however, were certain it was spring. Many of the birds noted were never seen, only heard: of the House Wrens, for example, we probably didn’t see more than 4 of the 32 cited; the rest were gaily singing from hidden perches in nearly every tree we passed. We saw so many flowers that our four-mile hike stretched out to five hours long, as we continually asked Peggy Burhenn, our indefatigable leader, “Hey, what’s this flower?” (Repeat 1000 times.) 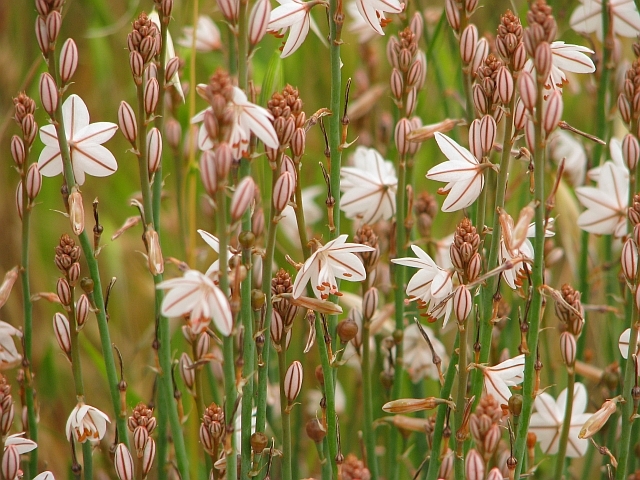 What she didn’t immediately know, she diligently looked up in her large handbook of California flowering plants. 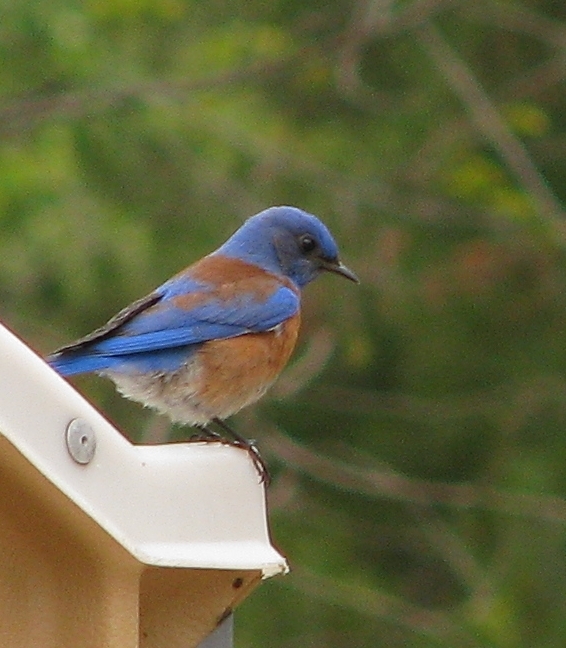 Western Bluebirds were in great evidence near all the buildings. At the Reagan Ranch we found both Cassin’s and Western Kingbirds bouncing over the flowers and grass. Four pairs of Orioles – both Hooded and Bullock’s – gurgled overhead in the roadside trees. At the Paramount Ranch western town a large flock of American Goldfinches contained several bright breeding plumage males among the numerous winter and molting plumage birds. Great Blue Herons stalked the fields looking for unwary ground squirrels, proving that they don’t have an exclusively aquatic menu. Overhead in several locations were flocks of swallows and swifts. We found most of the No. Rough-winged Swallows in a flock low over Malibu Creek flying through a gap in the reeds, feeding on a flock of insects close to the water. Many of the flowers were seen on our prior year’s trip but a few were new, perhaps because we were about 10 days further into Spring. Among them were: Cliff Aster, Morning Glory, White Nightshade, Common Goldfields, Strigose Lotus, Western Wallflower, Chinese Houses, Prickly Phlox, Winter Vetch, California Bickelbush, and Fennel. The weather, which looked like rain for a while, held, and we had a fine day. By the time we returned to Paramount Ranch, we were ready to eat. Brian Cohee took a great selection of flower photos on this hike. You can find a nice slide show of them here. 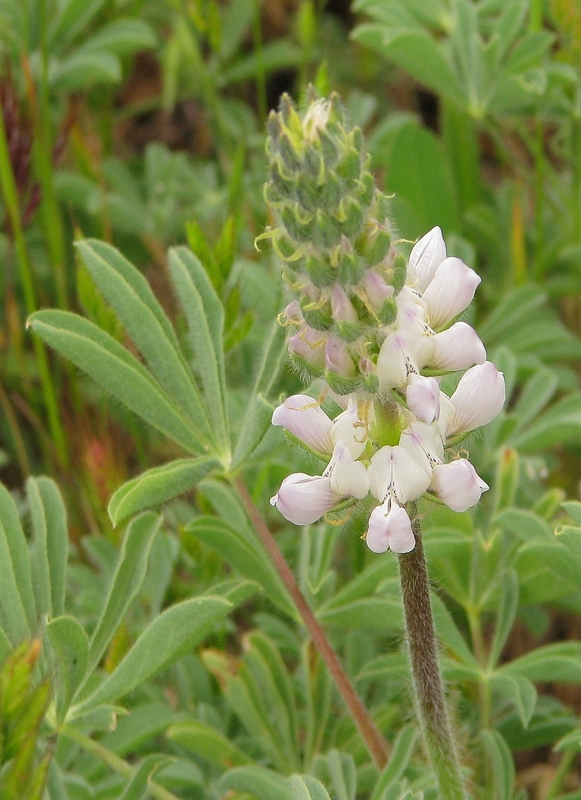 There is also a website with hundreds, perhaps thousands of pictures of flowers of the Santa Monica Mountains National Recreation Area. If you can’t figure out what was that bloom you saw on a local hike, check this out.